I've seen Star Wars more times than I can count (because I stopped counting around time #47); I know a good portion of Episodes 4, 5 & 6 by heart, and prefer to forget about most of 1, 2 & 3. But my favorite part was always Mos Eisley Spaceport ("you will never find a more wretched hive of scum and villany - we must be cautious...") and its creature-diverse cantina. Big drama goes down at the cantina - altercations that result in an arm on the floor (more on this later) and a dead Greedo; smugglers make business deals; and we get a glimpse of fan favorite Hammerhead. And of course, best cantina music of all time. Iconic. And so, in honor of Star Wars Day - May the 4th Be with You All (get it?) - it's about time that the cantina had its day in the Tatooine suns. So before I run back to Toschi to pick up more power converters, I'm pleased to share this collection of some of my favorite cantina-related video clips (some of them new for this year). College Humor takes you inside the auditions for the new Mos Eisley band - featuring some familiar faces. Speaking of the aforementioned arm on the floor, here's Robot Chicken's version of what happened to Ponda Baba (Walrus Man) that day. Anyone who's been on a Virgin America flight lately may have caught snippets of Nerdist's Course of the Force event. Here's their awkward display of Cantina Karaoke, featuring cameos from Jason Schwartzman, Patton Oswalt and of course, Billy Dee Williams. Happy Star Wars Day, 2010! What's Darth Vader up to these days? Recording voiceovers for the TomTom GPS system, apparently. Want more Star Wars goodness? See my reflections and video recommendations at Beliefnet's Idol Chatter, and don't forget my classics from the "May the Force Be With Us" category here at My Urban Kvetch. 'Perdidos': The 'Lost' Season Six Promo en Espanol! We last had a new episode of 'Lost' last May, which left us with crazy questions and cliffhangers to ponder during the rest of the spring, the entire summer, the entire autumn, and part of the winter before we got to our month of promised new episodes in "January" - which we all now know means "February 2." Some people are going to great lengths to avoid spoilers for the upcoming season, eschewing all promos lest some essential moment be spoiled. Others are taking this opportunity to go back and review everything that happened since Jack first opened his eyes to find he had survived Oceanic 815. Me? I want new 'Lost' episodes as much as Benjamin Linus probably wants bandages and healing ointments (which is probably a lot: that guy gets a beatdown nearly every episode - and pretty much deserves it every time). So if you're not among those who are avoiding anything 'Lost'-related until February 2 (dude, that's two whole months, come on...) then maybe don't watch this Spanish-language promo. But my opinion is that it's mostly review and dramatic representation of the characters with little-to-no real footage, so it wouldn't constitute a spoiler for anyone unless you haven't finished Season 5 yet. But what do I know? Listen to me or don't. After February 2, it's all the same. Or...it's all DIFFERENT. I guess it depends on whether the Constant and the Variable get nosebleeds, or whether What Happened, Happened, or if Jughead really exploded, or if baby Miles and adult Miles existing in Dharmaville led to some space-time continuum paradox precipitating Doc Brown to jump out of a Delorean, or whether Hurley becomes the writer of "Empire Strikes Back." Oh, just watch the promo. 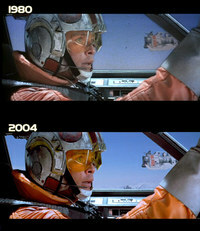 Fans Claim Scenes and Refilm Them for "Star Wars Uncut"
Not so long ago (now), in a galaxy not so far away (here), a small band of internet rebels stood against the evil Empire; mobilizing from separate rebel bases, they used all the tools at their disposal - PhotoShop, DreamWeaver, Flash, Java, iMovie and others - to recreate their favorite scenes in the classic sci-fi film "Star Wars." Some scenes are animated, others re-enacted with live actors, and still others transposed favorite scenes into contemporary contexts. The trailer below provides a glimpse into what the final film might look like. Now if you'll excuse me, I have to go to Toschi and pick up some power converters. No reason to kid about a site whose sole purpose is to translate English words and phrases into "R2D2-ese." I tried "Jewish identity" as my opening phrase, followed by "hydroplaning." They sounded remarkably similar, in that they both made me feel like a complete idiot for even visiting the site. And with that, enjoy the R2D2 Translator. Yeah, it was gradual. Frame-by-frame, if we retrace our steps. Perhaps it was seeing the original trilogy about 50 times on Channel 11 and then in the grainy splendor of VHS. (I lost count after that). I can probably blame my brother a little bit for his extensive collection of Star Wars figures that taught me all the names of the obscure but memorably designed creatures like Max Rebo, Admiral Akbar, Nien Nunmb and Salacious Crumb. They even helped me in school. When I had difficulties pronouncing the word "admirable" (I kept saying "adMYrable"), I mnemonicked: "Oh, like "Admirable Akbar." And when a PSAT section on analogies used the word Rancor, I knew it couldn't be good and looked for the closest analog to "big angry monster with lots of teeth that Jabba the Hutt might keep under his floor to eat errant slave girls and pig-faced guards." Clearly, the establishment of a "May the Force Be With Us" category on this site was one symptom. The late-night immersion in conspiracy and sci-fi via the X-Files was another. And my falling head over heels with my new Wired subscription was like the tingling in in your left arm that signals a coronary event. But the good kind that sparks your awareness of yourself, that makes you feel alive, you know, like the feeling of the wind in your rumpled hair as you glide across the hot sands of Tatooine in morning, under the heat of two suns fighting each other for supremacy of sunrise in the reddish gold sky. And then there was the sentence I wrote in my book proposal, which I include contextless here, so you can see how deep the psychosis goes: "I feel suddenly ill, like Obi-Wan Kenobi, who sensed the destruction of an entire planet and was physically weakened." I had internalized the language in less than ten parsecs. It was time to go off to Taschi to pick up some power converters. And my odd fascination with this StarWars.com feature that analyzes frame-by-frame how the 1980 version of ESB differs from the 2004 rerelease, down to the last gas trail from rebel snow speeders on Hoth. And my obsession with the names of Star Wars and whether they're of biblical or Hebrew origin. There was my going to a late-night showing of Episode 3, even though it wasn't opening night. There was the fact that I went to see this show. Twice. Beyond the galaxy far, far away, there was other geekitude, but most of your probably viewed it as a girlish weakness for all things Whedon. Beyond Buffy and Angel, there have been other symptoms. Even before I subscribed to David Pogue's posts, or became a blogger, or delighted in Lifehacker, and before I started beginning all my sentences with "There was this really cool gadget in Wired that...", there were signs that I was getting in too deep. And you all are complicit in my nerdicization, for you did nothing to prevent it. I hope you're happy with yourselves. Ever wonder what would have happened if Darth Vader had a younger, less talented brother who was a day shift manager at a local supermarket? No? Me either. But that doesn't stop those wacky MySpacers. Click the link below for a tragicomic tale that's part Star Wars, part Go. Is Israel on a hellmouth? Is the truth out there, and what's the deal with the black oil? In space, can anyone hear you scream? Was matzah created by mutants? And does Frodo wearing the ring create an impromptu "harei ata mekudash" between the young hobbit and the forces of evil? [director of the event Ilan] Aminov adds that the theme, "destiny and free will," is an appropriate one for Pessah. With the kosher-for-Passover fare that will be served and the committed fans who follow their favorite shows with fervor, the result is something of a religious experience. And it's also worth noting that in some systems (most notably, on a small moon near the ice planet Hoth) "beam us up" is a synonym for aliyah. For more, check out olamot.org. And if you go, send me a report or something. Paging William Shatner...your services are needed over at StarWars.com, where a new blog features a Star Wars joke of the day. How many Jawas does it take to change a lightbulb? Four -- three to pile on top of each other to reach the socket, and another to sell the old bulb "as good as new." How do you melt all the ice on Hoth? Take away an "h" and make it hot! And I thought I was bad, with a category called "May the Force Be With Us"? Bill, please report to StarWars.com, jump out from behind a Gungan and tell this poor chap to "get a life..."
The dude, YZ Freedman, looks like half the men I know on the Upper West Side. At first I assumed he was single, and that he could be finding his shidduch, and instead he's spending all his time on the internet sorting through jokes about how it's become impossible to find parking at Mos Eisley Spaceport. But according to the profile on StarWars.com, the dude's got a daughter. And a dayjob working for Entertainment Tonight. And he "doesn't post on Saturdays," which I assume is code for "I'm observant." Germans love David Hasslehoff. Jews love Star Wars. Discuss. I'm a little bit of a scifi/fantasy nerd--a condition for which I blame the original Star Wars trilogy and the opus magnus of Joss Whedon. Now said condition is worsening, thanks to Lost. But I digress.) So to protect myself, I took myself to another coast to avoid dealing with the "should I stay or should I go" of New York ComicCon.